"41MR12, Burial II, 104" by Timothy K. Perttula and Robert Z. Selden Jr. VESSEL FORM: Jar with a direct to slightly everted rim and a rounded, exterior folded, lip. There are four rim peaks and four strap handles, each strap handle placed under the rim peaks. DECORATION: The rim is decorated with vertical incised lines; the small strap handles are plain. The vessel body has an appliqued design that includes repeated and alternating sets of appliqued circles and triangles. Within each circle is a single short appliqued ridge. The appliqued triangles (set between the appliqued circles) have two opposed sets of appliqued ridges and a single vertical appliqued ridge. 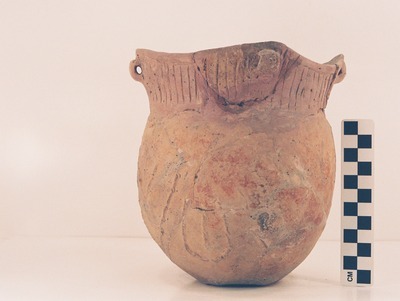 Harleton Appliqued jar from Burial II at the Ben McKinney site.